“The New Normal” in the spotlight on this site. (CLICK HERE). Peter Hinssen proposes his disruptive ideas in a most agreeable and convincing way through storytelling. Stories and historic anecdotes give insights and help to understand that disruption and change is of all ages. He opens with the story of Herman Kahn, founder of (a.o.) the RAND foundation. In 1967 he produced a report (“The year 2000: A framework for speculation on the Next Thirty-Three Years”) in which he described a number of new technologies, most of which would be invented (and change the world) in the following decades. Kahn worked with models, but realised that they often led to wrong predictions because of ‘imponderables’. Hinssen uses the acronym VUCA: we live in a world that is becoming more and more Volatile, Uncertain, Complex and Ambiguous. The antidote is VACINE: you have to develop Velocity, Agility, Creativity, Innovation, Network and Experimentation. The internal clock of your company or organisation must be no slower than the external clock (of the environment, sector or world you work in). Building normal airplanes is something that many people and companies know a lot about; building supersonic airplanes requires a whole new set of rules and knowledge. Only a few companies master it (and only for military planes). The most difficult thing is to build an airplane that can do both. That is where the network comes in, in order to combine the know-how of more than one field. Look at distribution today. Classic stores falter and internet sales seem to take over. But the winners will be those companies that ‘network’ between both types of sales and distribution. They will combine elements of both online info-and-sales with the logistics and the look-and-feel that brick and mortar shops can offer. Apple knows and invests in both a unique internet platform and a network of stores. At speed ! Peter uses the image of a dual pendulum. There is a simple formula to predict the movement of a normal, single pendulum (although in itself not ‘linear’). Append a second, different pendulum at the end of the first one and the movement becomes erratic and much more difficult to predict. In networks, similar ‘movements’ occur. The strategy of one company is quite predictable. But combine several companies, with different capabilities in a network and the interactions and combined dynamics can rapidly become ‘unpredictable’. A network of different players can achieve moves in the market that no company alone could ever achieve. Instead of having a master plan, things ‘emerge’ (like the flow of lava out of a volcano). Complex systems have ‘connectivity’. Like a spaghetti: you pull a string here and the whole plate moves and is affected. They also have ‘coevolution’: networks not only adapt to their changing environment; they get to change their environment at the same time. They are ‘not perfect’, favour ‘variety and diversity’ and are ‘self-organising’. This chapter bursts with stories about people who used information in unprecedented ways to do great (and often funny) things. Learn not to see information as a pond (a database) in which you fish for data. If you do it alone, in your own little pond, or with a few others in a common pond, you will never catch as much as if you could fish in a large, common river that combines information from all possible sources. Of course, many more will be fishing in the same river. The one with the best ‘filters’ will catch the most, best or biggest fishes. In a world that overflows with information, it is no longer a question to master the information. It’s about fishing with the right ‘filters’, that extract what you need from that river in the most effective and efficient way. And evidently information and ‘filters’ flow faster in a network than through a single, let alone hierarchically organised company. Hinssen pays particular attention to ‘education’ as a specific type of ‘information sharing’. Obviously, if we really want to pick up speed, we will have to organize education in ‘networks’, rather than in separate institutions or institutes. Think about patient education: today, everybody does it alone (authorities, universities, patient- and professional organisations, pharmaceutical companies…); each on it’s own island. Why not let education ‘flow’ on large platforms that we share, use and develop together, as a network ? Philip Kottler’s and David Ogilvy’s stories open the chapter on marketing and publicity. The old rules of both disciplines don’t work anymore in a market that plays along the tunes of Firefly, Amazon, Netflix and who knows what new start-ups that will turn the old models even more upside down the next couple of years. Consumers have taken over and can do so with apps, information sources and tools that not only empower them, but along the way generate enough new (free flowing) information to make even more fundamental changes possible in the near future. The basic mechanism behind all these changes, once again, is the network. Seth Godin (another one of Hinssen’s stories) says it's a ‘tribal’ approach: groups of consumers dynamically get together around new products and services, both to co-create and to promote them. Think about Kickstarter to understand how new marketing works, getting from a (crazy) idea, over a phase of both feedback and crowd funding to an outcome where consumers fall in love with the product they have co-created, even before they finally get it. Then the cycle starts all over again; without any formal structure or master plan; ‘emerging’, ‘co-evolving’, ‘self-organizing’ and ‘not perfect’… VUCA and VACINE at the same time. Peter spends a short but very interesting chapter on the future of healthcare. He argues that it still has a long way to go from a value chain (constructed around products) to an ecosystem, built around individual patients. Today we treat patients based on clinical trials that show what is supposed to be the best treatment, based on statistically representative “averages” of results. Technology, genomics, free flowing information and patient empowerment are rapidly changing these old rules. Networks of caretakers, suppliers and authorities will have to replace the old paradigm of clinical trials when healthcare will rapidly become a matter of ‘n=1’, in the era of the individual treatment. Group Action Power to the People. I will now let you down. In my personal copy, the last chapters of Peters Hinssen’s book are full of dog’s ears, marking pages that contain ideas and insights that are the most valuable. I won’t reveal what they really are, except for a few hints: Peter not only gives a lot of examples of start-ups that are revolutionizing whole sectors, using network ways; he also reveals a number of strategic leads that help you to avoid being a ‘frozen’ organisation (focusing on ‘structure’ and control), in order to become a ‘super-fluid’ organisation that nurtures the networks within and around themselves activating innovation, experimentation and real involvement of everybody in each process. This part of the book is for yourself to discover. Just do it ! Peter Hinssen brilliantly compares what is happening all around us today with boiling water. You heat it up to 99°C and nothing happens. The water only becomes hotter. But then at 100°C, things change instantly, when the water starts boiling. That is ‘the flip’. That specific point in the S-curve when old rules no longer work and networks take over. In an instant everything changes. Many markets have already gone beyond this point. I think the healthcare sector is slowly moving up somewhere between 90 and 99°C. The question is not as much when we will reach the boiling point. The real question will be whether you will be ready when it happens. NB: this pdf is only for yourself. I hope you understand that I prefer that people visit this site, instead of getting what I write from somewhere else. Just point others to www.de7de.be , let them discover themselves and encourage them to sing up for free. Thank you! 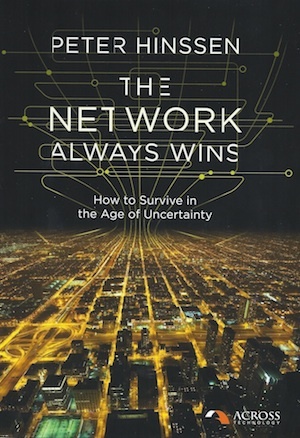 PS: The original subtitle of the book was: “How to survive in the age of uncertainty”. 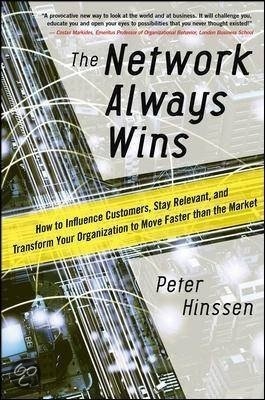 For unknown reasons the publisher changed it in “How to Influence Customers, Stay Relevant, and Transform Your Organization to Move Faster than the Market”.